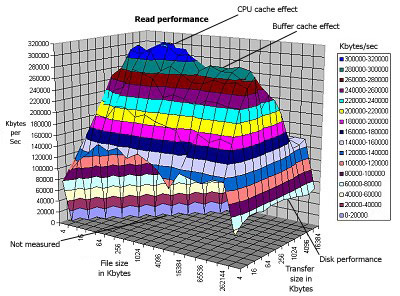 IOzone is a filesystem benchmark tool. The benchmark generates and measures a variety of file operations. Iozone has been ported to many machines and runs under many operating systems. While computers are typically purchased with an application in mind it is also likely that over time the application mix will change. Many vendors have enhanced their operating systems to perform well for some frequently used applications. Although this accelerates the I/O for those few applications it is also likely that the system may not perform well for other applications that were not targeted by the operating system. An example of this type of enhancement is: Database. Many operating systems vendors have tested and tuned the filesystem so it works well with databases. While the database users are happy, the other users may not be so happy as the entire system may be giving all of the system resources to the database users at the expense of all other users. As time rolls on the system administrator may decide that a few more office automation tasks could be shifted to this machine. 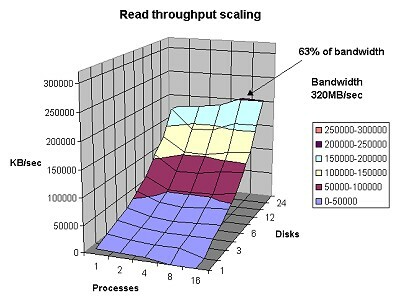 The load may now shift from a random reader application (database) to a sequential reader. The users may discover that the machine is very slow when running this new application and become dissatisfied with the decision to purchase this platform. By using Iozone to get a broad filesystem performance coverage the buyer is much more likely to see any hot or cold spots and pick a platform and operating system that is more well balanced. 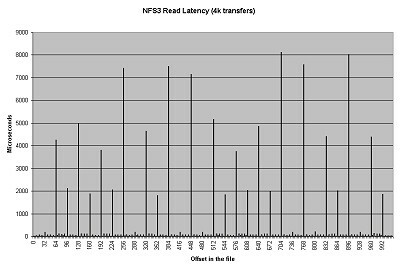 The NFS3 Read Latency graph shows the latency of 4k read operations over an NFS Version 3 filesystem mounted on a client running Iozone. Click on image for a larger view. 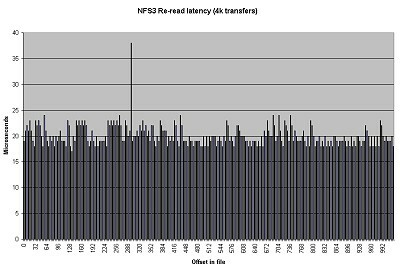 The NFS3 Re-read Latency graph shows the re-read latency of 4k reads over an NFS Version 3 filesystem. One can clearly see the effects of the client side cache. Here the latencies are the same as local buffer cache latencies. Click on image for larger view. Typical Linux result example with annotations. Typical Windows2000 result example with annotations. Windows 2000 Iozone graph example. Comparisions of various filesystem types. MS Word: NFS MS Word presentation. PDF : Revised NFS Client performance presentation. MS Excel: NFS Throughput example. Don't forget to tryout the new "fileop" that is included in the Iozone kit. Another benchmark folks might find interesting is SPEC's SFS2014 benchmark. Use of official logos is with permission of the respective companies. On the topic of Encryption, I'm on the tech side of the house. Encryption is what makes ecommerce safe, protects our banks, power grid, and our national security. Any introducton of backdoors, for law enforcement, is insane. Backdoors either exist or they don't. If they do then hackers and foreign governments can gain access. To demonstrate my point here is a link to some encryption software that I wrote that has no backdoors, and can be used for whatever purpose you wish. The code is open source, and you get the full source code. This kit provides the routines needed to encrypt text or binary data. It is a symmetric algorithm. The keys to decrypt must be exchanged with the recipient via a seperate communication. The user should never reuse any keys from previous transmissions. An Encryption kit with no backdoors.